Nauchandi is a boutique in Indiranagar that is here to complete your global desi look with it’s pretty and chic indo-western designs. What’s more? All outfits here are customisable. With their chic and desi designs, Nauchandi is a clothing brand that we’re loving. 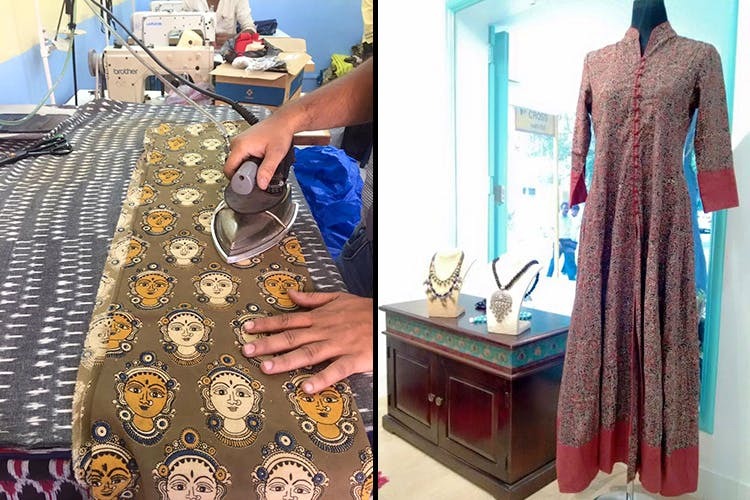 We spotted some quirky flowy kurtas and pretty block-printed summer dresses on their rails at their cute little Indiranagar boutique. Made with traditional Indian handloom fabrics, these clothes are top quality and have had a lot of work put into them. And the best part is that everything is totally customisable. With an in-house tailor, Nauchandi takes orders and delivers a well-fitted and customised clothing option. Everything from the size to the design of the piece can be altered. All the material used here are gorgeous handloom textiles such as tussar silk, cotton, linen, and ikat sourced from many nooks and corners from all over the country, including the interiors of cities like Jaipur, Mumbai and Hyderabad. The brainchild of Pragya, a former advertising professional with a passion for fashion, Nauchandi was started with the idea of bringing gorgeous handloom fabrics from all over the country to the contemporary mainstream fashion. Apart from kurtas and dresses, Nauchandi also has some beautiful Benarasi duppattas and embroidered silk scarves that will add that extra bit of sass to any outfit. And there’s a small yellow corner in their store dedicated to jewellery and other accessories. We spotted some beautiful ear cuffs and some stunning Afghan jewellery here as well. The clothes here are priced at a range starting at at INR 1,000 to around INR 5,000. You can buy their stuff straight off the racks at their boutique in Indiranagar, which is pretty easy to spot with its pretty turquoise door and off-white walls. They also have a space in Safina Plaza you can check out. Make sure you book an appointment two hours prior to visiting by calling +91 9686661440.